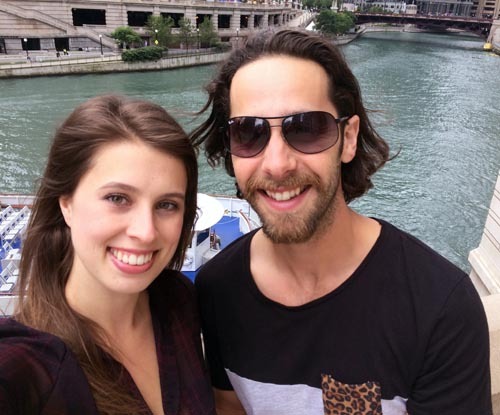 Last weekend Dev and I travelled to Chicago! 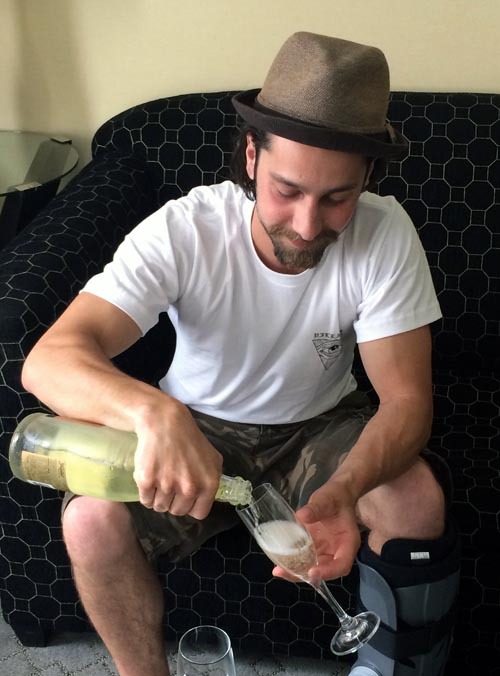 It was a trip I planned to celebrate my beau’s ‘Champagne Birthday’, as he recently turned 27 on June 27. We had an amazing time and I thought I would share some photos and tell you about our adventure. We decided to road trip it, which was actually quite easy and fun! It took us roughly nine hours both ways, but I think luck was on our side. Wait times at the border were minimal and it was smooth sailing the rest of the way. Despite being warned of traffic chaos in ‘The Windy City’, we seemed to avoid it all. After a full day of travelling, I thought it would be nice to have a cold bevy awaiting our arrival. I called the hotel ahead of time and arranged to have champagne in the room once we checked in. The bubbly seemed appropriate considering the occasion we were celebrating. I notified the hotel that it was Dev’s birthday and they very kindly gave us a room upgrade. It was a lovely surprise and greatly appreciated. 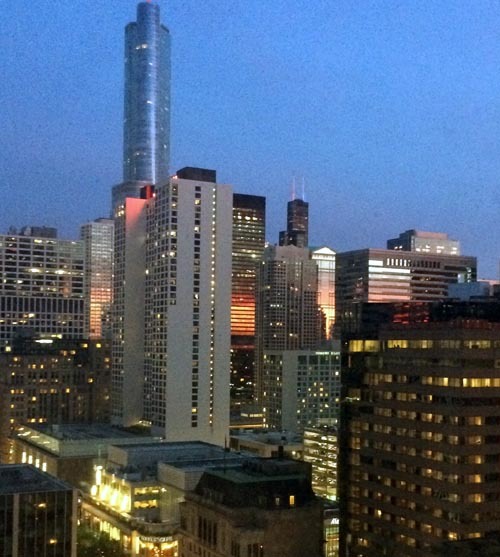 We stayed at the Warwick Allerton Hotel on Magnificent Mile, for your information, and I can not say enough good things about our experience. The staff were all so friendly. Rooms were clean and well-maintained. Coffee and tea in the morning was a pleasant bonus for us caffeine addicts. And the location was just perfect. I would definitely stay there again. Unfortunately, Dev broke his foot the week prior to our trip, so walking was kept to a minimum. Although I have to say I am impressed at how much walking we did do. We spent our first day visiting Eataly, an Italian marketplace owned by Chef Mario Batali, and shopping along the Mag Mile. 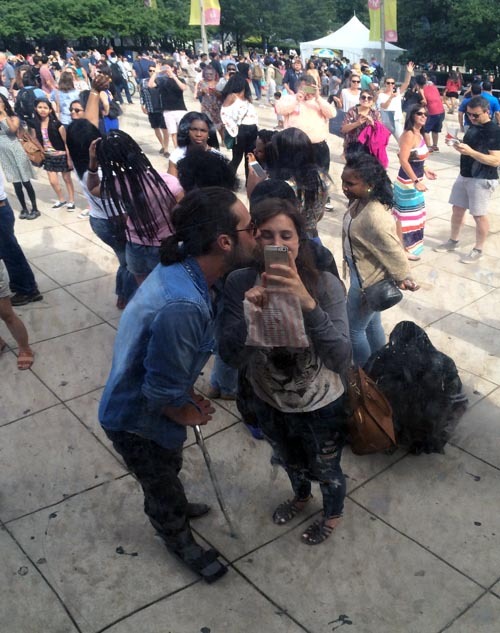 He was a TROOPER and we definitely made the most of our time in Chi-Town. Even if it meant going at a slower speed!! 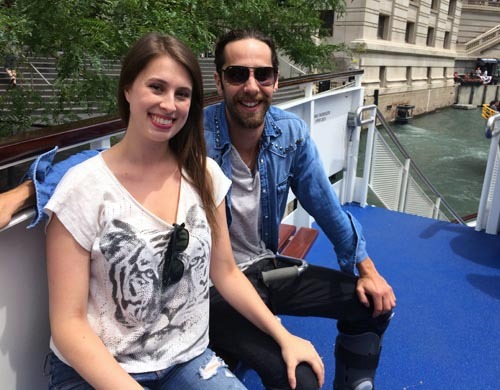 One of the highlights of our trip – which didn’t require walking at all – was an architectural boat tour. 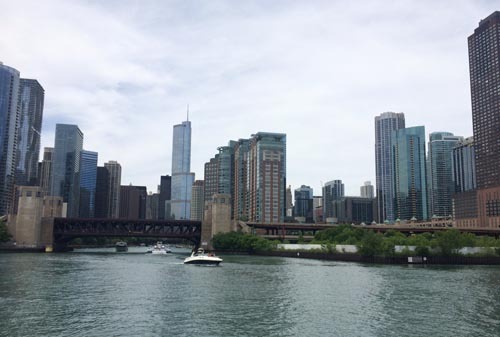 There is so much history behind Chicago and it was interesting to see parts of the city we may not have been able to get to otherwise. The tour guide was incredibly knowledgeable and we learned a great deal about the buildings along the river and how they differ from one another. Plus there was beer aboard the ship, which made our time cruising that much more enjoyable. After our cruise we spotted Stan’s Donuts and my sweet tooth told us we had to go in. 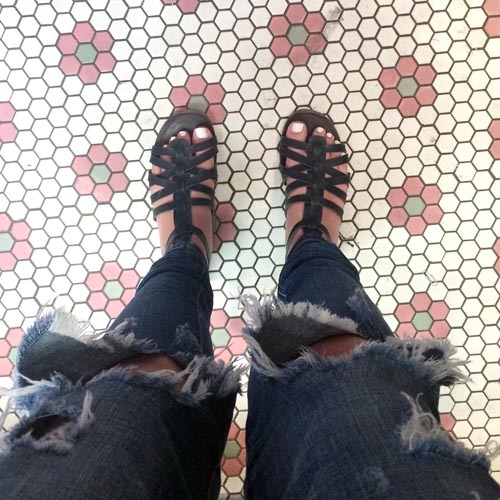 Or maybe it was the beautiful tiled floor that lured me…I’m a sucker for pink. 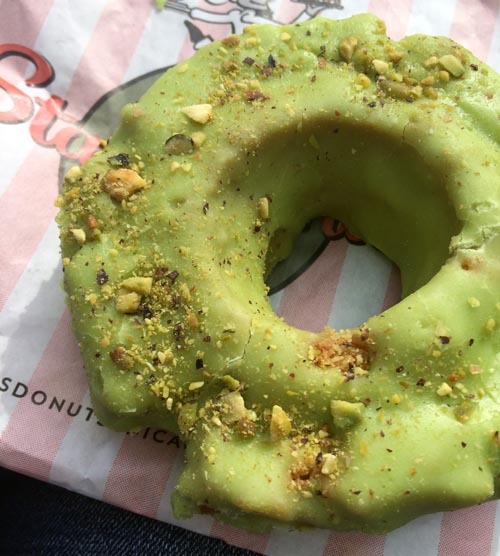 We opted for a lime green, lemon and pistachio glazed old fashioned donut. The colour may not be appealing to everyone, but it’s what sold us and it was scrumptious! If there’s one thing we like to do during trips, it’s eat and experiment with new foods. 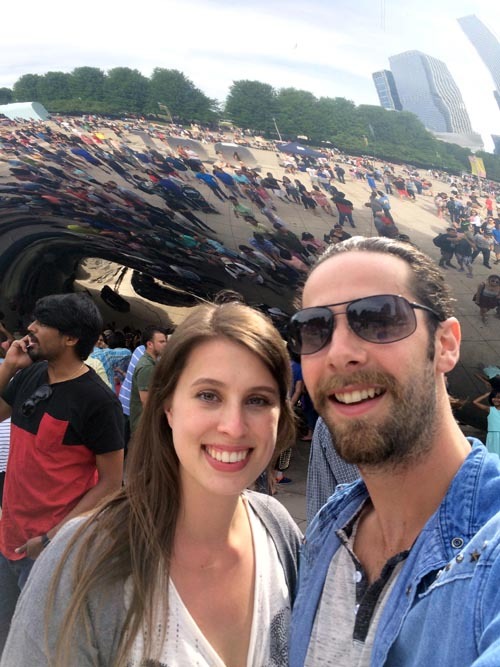 Of course no Chicago trip would be complete without visiting Millennium Park to see ‘THE BEAN’ – otherwise known as the Cloud Gate sculpture. Despite an overwhelming crowd of tourists from all over the world capturing images of the iconic landmark, it was cool to see. It’s definitely an interesting sculpture, with seamless steel edges that mirror its surroundings. My first thought, however, was that the struggle must be real to keep it clean. Between smudges from handprints and bird poop blobs streaking down the side, it must be a nightmare! So we may be slightly out of focus, and you can see some of the splotches on the sculpture, but this last photos melts my heart and I had to share. #Lovebirds! Dev and I shared an order of the calamari, which was served cold (salad style) with with radishes, cucumbers and pistachios. It was unlike any calamari dish I have ever tried before and it was TASTY! We also split the Harissa lamb ribs, which were cooked to perfection and melted in our mouths! There were other items on the menu including milk braised pork shoulder, pig’s ear with crispy kale and pickled cherries, roasted bone marrow, and salt-cured greek yogurt spread – all of which would require an adventurous palette, but I bet are out of this world delicious. I seriously wish it was a chain and they had a location in Toronto. I also wish we hadn’t waited until our last day to go there. If there was more time, I would have returned and ordered nearly everything on the menu. All in all, we had a great little getaway and I feel lucky to have shared it with my best friend! 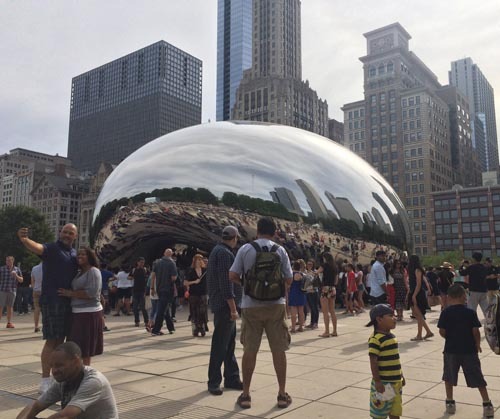 Chicago is a great city and I hope to return some day soon.